I’ve had a few questions from readers as to my views on The Rake’s new collaborations – products that the magazine started selling on its site a couple of months ago. I’ve seen most of them first hand, indeed in some cases witnessed them in the process of creation, so happy to give my views on how they look and feel. I was surprised that among my favourites were the Rubinacci scarves (£380). 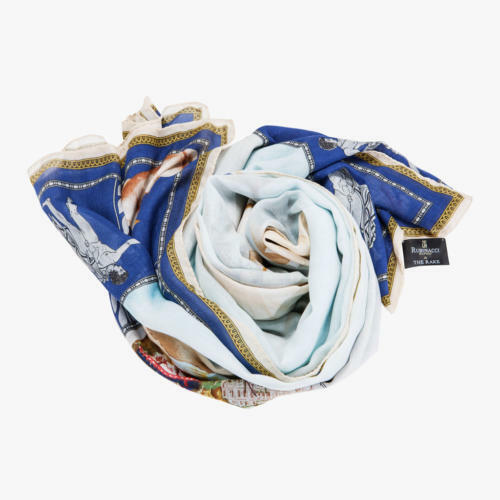 A silk/modal fabric mix is unusual, but it works well as a summer material – the silk gives it a luxurious touch, and the modal is cool and lightweight, without the wrinkliness of cotton. 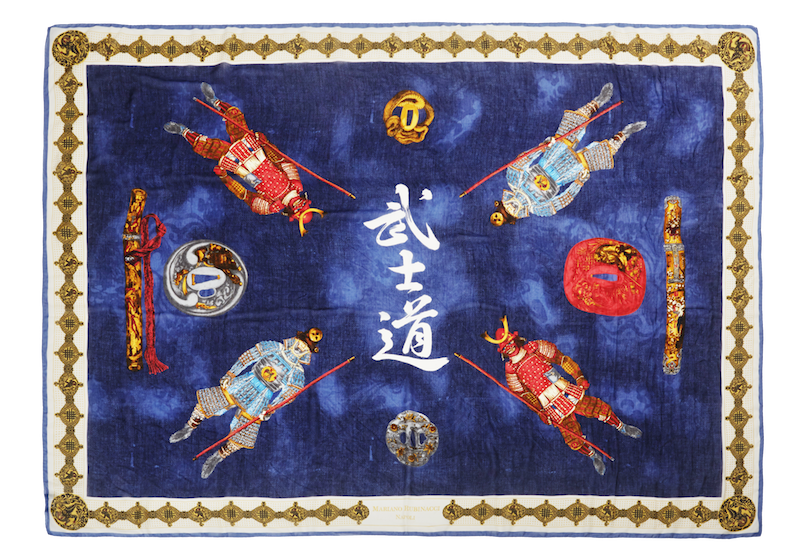 I also like the designs – the Samurai one at top in particular. Collaborations should be about unique products, or combining the tastes of two different organisations or viewpoints, and this is both very Wei and very Luca. 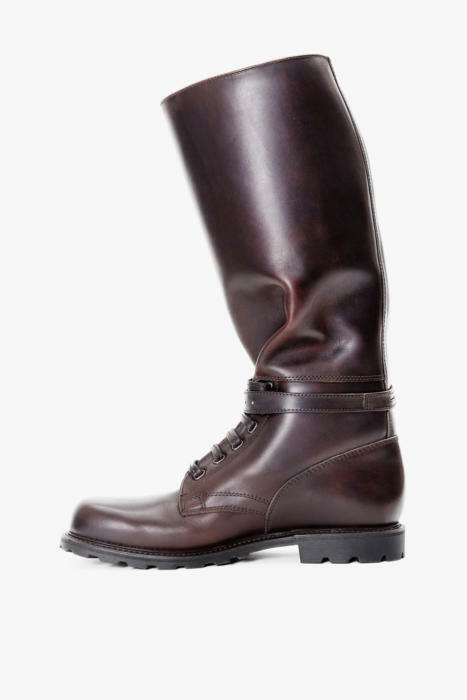 I’m also a fan of the Husaren boots from Ludwig Reiter (£1,100). So much more enjoyable than a wellington boot on a really horrible, wet day, with their heavy waxed calfskin. The Drake’s ties and Thurston braces will be familiar, but have been commissioned in unique colours and archive materials. The Sexton products are rare in also being available from Sexton themselves – most others are exclusive to The Rake. The trainers, obviously, are not to my taste. Neither are the camo headphones. But looking at the future roster of things coming up, I’m pleased to see that everything is of a consistent taste. Collaborations are, at root, a customer’s fantasy of creating his own product. And if that customer’s vision doesn’t come through, it is a waste. You can follow the discussion on The Rake collaborations by entering your email address in the box below. You will then receive an email every time a new comment is added. These will also contain a link to a page where you can stop the alerts, and remove all of your related data from the site. Those boots are gorgeous, and may be something I have to buy. It would be really interesting to me, if you did a piece on Wellies, and/or country attire. It’s such an interestingly different form of dress… And is very easy to verge into costume. To me it is also interesting how second nature it is to us. The, relatively, recent case of David Cameron foregoing his “posh” wellies in favour of buying some cheap Argos ones to not appear spendy –yet he’s happy to wear A&S suits anywhere. I would love to know about more artisanal makers of things like wellies, having only recently seen the shop videos at Le Chameau and how much more independently they are produced, and are an example of craft, than say Hunter. Country folk wear Aigle, farmers, labourers and gentry alike. Wellies are equipment – it’s no fun if they let you down. Hunters are fine for Islington. Thanks for this Simon – couldn’t resist ordering a pair of those boots – I have been thinking of getting a pair of posh wellies for a while and these will fit the bill perfectly. Sorry for this late comment this post. Good idea for this one. Personally, I would like to know how you find the traveler navy blazer made by the Rubinacci. Do you have any idea of the fabric? Is it Italian or British? Thanks. The Husaren boots are the ones I had in mind to be worn in wintery blizzards with your new Sexton Great Coat.